Most are likely aware that excellent customer service is an important element of success in retail. However, what might be less clear is what excellent customer service means. It is surprising how many companies (in both retail and other industries) forget about the simple concept that I put forth in the introduction to this series of posts: success in retail is about making the customer happy. In a retail setting most interactions and transactions follow a relatively simple progression. In most situations it is easy for a retail associate to be friendly and smile, show a customer where a product is located, give them some information about it, or ring them up. However, a retailer may have hundreds or thousands of customers on any given day, and through all of those interactions many unique questions and situations will arise. Excellent customer service means that each employee in a store asks "How will this make the customer happy?" before responding to a question or making a decision that will impact the customer. Often times an employee may feel at the mercy of a company policy when handling a unique or difficult situation. This might lead to a knee jerk reaction to answer a question or handle a situation strictly according to company policy. Unless the company policy empowers the employee to make a decision according to "How will this make the customer happy?" it will likely lead to a situation in which the customer is left feeling like the retailer is not on their side. Each element of GOT A PEN is about making the customer happy. If you ask any Bed Bath & Beyond employee about GOT A PEN they will be able to recite it on the spot, and if you were to walk into an employee area in a store you would see posters and other signs with GOT A PEN on them. These posters are not mandated by the corporate office; employees embrace GOT A PEN because it is a great policy that makes customers happy. Since it is easier and more fun to work in a store with happy customers, the employees love GOT A PEN. GOT A PEN accounts for standard customer interactions, as well as outliers in which problems or difficult questions arise. Pass the buck means that if an employee is unsure of something, they will refer the issue to someone who is equipped to handle it, and because they will "Never say no", they (or whoever they pass the buck to) will always have a dialogue with the customer. Is the customer always right? It is important to maintain a mentality around the customer always being right, and always give them the benefit of the doubt. The customer is almost always right, but not always. In those cases in which a customer is wrong (for example, trying to return an item that has blatantly been used or arguing about price on a product that was missing a price tag), it is important to have a dialogue with the customer. Explain the reasoning for your decision in a calm and composed manner. As long as you make the customer feel like you care about them and you act in a reasonable manner, you will make most customers happy. Some customers cannot be appeased; maybe they are in a grumpy mood or are just permanently grumpy. This is unfortunate, but there is nothing that you can do if they have already made up their mind to be adversarial. Excellent customer service is not just about dealing with difficult situations; it is also about going the extra mile when the customer might otherwise expect a standard transaction. 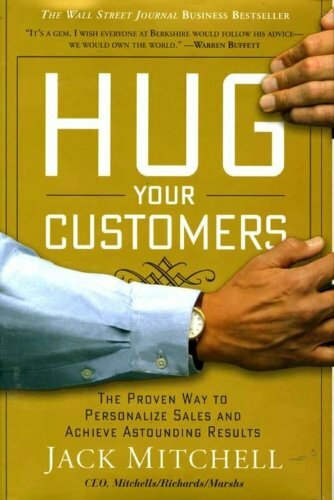 Some of my favorite people and companies do this - what Jack Mitchell (a retail and customer service guru) defines as "Huggers". Mitchell loves to "Hug" his customers by offering them unexpected things that make them happy. Bed Bath & Beyond is filled with huggers whose stories about going "Beyond" were often featured on the company intranet. Nordstrom is also well known to go the extra mile to service its customers. Examples of some "Hugs"? Going out of one's way to personally deliver a product to a customer, writing a personal thank you note to a customer, or remembering a customer's name. These might seem like time consuming tasks, but when a retailer creates an environment that encourages "hugging", they often occur naturally. Furthermore the resulting positive energy will make both customers and employees happier to be in the store. Excellent customer service is about asking "How will this make the customer happy?" while handling a difficult situation, as well as going out of one's way to make the customer happy when they might not expect it.